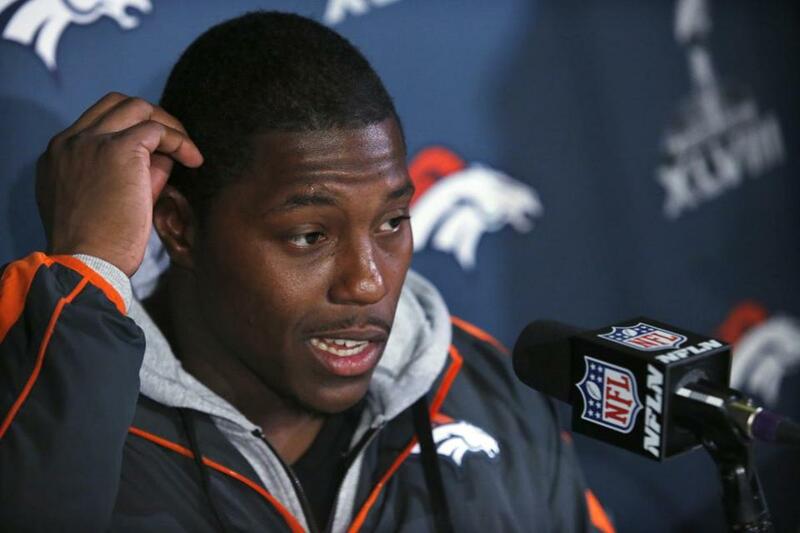 Knowshon Moreno grew up close to the site of Super Bowl XLVIII. JERSEY CITY — Knowshon Moreno doesn’t quite understand what the fuss was all about. Well, OK, sure, the TV cameras did catch two giant teardrops going down his cheeks — one from each eye — at the conclusion of the national anthem before the Broncos’ showdown with the Chiefs Dec. 1. But that’s not unusual, is it? You’ll have to excuse Moreno if the waterworks open up again Sunday night when he plays in the Super Bowl in the shadow of his hometown of Middletown, N.J. Moreno has had a breakout year in his fifth NFL season, rushing for 1,038 yards, gaining 1,586 all-purpose yards, and scoring 13 touchdowns, one of five Broncos in double figures this season. And Moreno, 26, certainly appreciates his current opportunity. The first 10 years of his life were spent bouncing between downtrodden apartments and homeless shelters in New York City with his father, Freddie. Moreno, whose name is an amalgamation of his father’s nickname (Knowledge) and his mother’s name (Varashon), finally settled in with his grandmother in Middletown, and blossomed in football and track. He eventually became a star running back at Georgia and then the 12th overall draft pick by the Broncos in 2009, signing a contract worth over $13 million guaranteed. Moreno’s professional career certainly hasn’t been perfect, either. Drafted by Josh McDaniels with high expectations, Moreno was decent in his first two years, rushing for 1,726 yards and 12 touchdowns, but he fell out of favor when John Fox took over in 2011. Moreno eventually lost his starting job to Willis McGahee that season and tore his ACL in the seventh game, ending his season. And in 2012, he suffered a punishment that Patriots fans can understand — when Moreno fumbled in Week 2, Fox kept him inactive for the next eight games, and Moreno didn’t play again until Week 12. But McGahee is out of the picture this year, and Fox is now confident in the progress Moreno has made as an all-around back, Monday calling him “maybe one of our most improved players this past season.” This was his first 1,000-yard rushing season, and he had 100-plus all-purpose yards in eight of 16 regular-season games. His best was in Week 12 against the Patriots, when he rushed 37 times for 224 yards and a touchdown in the Broncos’ overtime loss. Moreno’s teammates know how much he has been through and how much he loves the game, and were equally surprised his tears became such a big story — a parody video of Moreno crying to the tune of Whitney Houston’s “I Will Always Love You” has been viewed more than 460,000 times on YouTube. Reaching the Super Bowl is always special, but Sunday’s game has a little extra meaning for Moreno in that it will be played some 40 miles from his hometown, with friends and family expected to be in the stands. Moreno didn’t get much press this season — the passing game of Peyton Manning, Demaryius Thomas, Wes Welker, Eric Decker, and Julius Thomas took up most of the press — but Moreno, who stands 5 feet 11 inches and weighs 220 pounds, was a crucial piece that gave the Broncos good balance in their offense. The Broncos just have to make sure he can make it to game time Sunday without letting his emotions go “through the roof,” as he put it Monday.